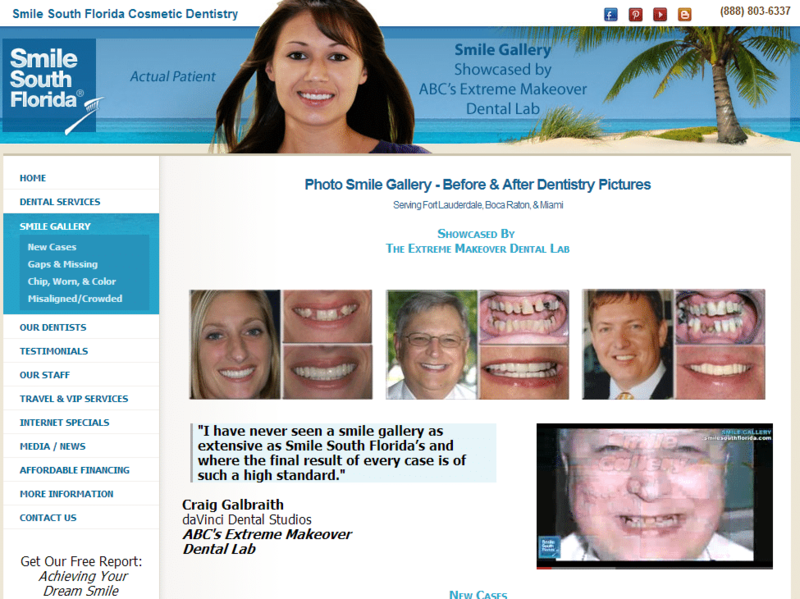 South Florida Cosmetic Dentistry is announcing the launch of its enhanced website. The new website provides current patients, prospective patients, and readers with information about the various dental procedures and services that South Florida Cosmetic Dentistry offers its Fort Lauderdale, Boca Raton, Miami, national, and international patient base. To visit its new and enhanced website, go to www.smilesouthflorida.com. Unlike several other dental practice websites, South Florida Cosmetic Dentistry provides visitors a photo smile gallery of its actual patients. All photographs on South Florida Cosmetic Dentistry’s website are that of its own patients, rather than stock photographs of models. The smile gallery has a vast collection of patient before and after photos with a variety of dental conditions and treatments discussed. In addition, the South Florida Cosmetic Dentistry website’s content is fresh, expansive, and written specifically by or for South Florida Cosmetic Dentistry. The dental content is organized in a manner to help the viewer get the information they need in a timely manner. The South Florida Cosmetic Dentistry Blog is integrated into the website’s content management system to aide it in providing content to the viewer fast and efficiently. To visit its blog, go to www.smilesouthflorida.com/blog. The creation of this advanced content management system (CMS) with integrated weblog was not an individual manifestation. It was the collective efforts of Alex Nottingham, Benek Designs, Sinai Marketing, and Jenotek. Mr. Nottingham, South Florida Cosmetic Dentistry’s Operations Consultant, organized the team, managed the project’s development, and faciliated the training and implementation process for South Florida Cosmetic Dentistry. Benek Lisefski is a creative web designer and developer working from Auckland, New Zealand. He created for South Florida Cosmetic Dentistry a simple, beautiful interface design with clean, search-engine friendly XHTML and CSS code. Check out his design portfolio at www.benekdesign.com. Sinai Marketing is a first class search engine optimization (SEO) company. They used code-efficiency optimization techniques, along with high quality link building methods to place South Florida Cosmetic Dentistry high on the search engines. Learn more about Sinai Marketing at www.sinaimarketing.com. Jenotek is a software and web development company. Its lead progammer, Matt Heckmann, aided South Florida Cosmetic Dentistry in the customization of its HTML/PHP coding, hosting of its websites, and management of its domains. Visit www.jenotek.com to get a list of Jenotek’s services.